I recently started a new occasional feature called "Spotlight On..." where I will be featuring a blog that I love that you may not know about. I'm very excited to introduce you to Erica from B is for Boy today. I'm thrilled to tell you that Erica will be guest posting here next week! Can't wait! Make sure you leave Erica some comment love and visit her over at B is for Boy. She's also in the process of opening an Etsy shop, so wish her luck. Thanks so much, Erica, for letting me feature your blog today! Click here to see more "Spotlight On..." features. 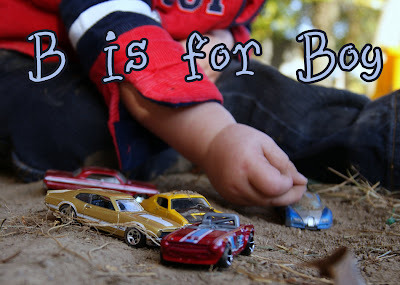 Just the blog title got my attention...with me being a momma of just boys. :) I love all the creations Erica has made! That fold up bib is genius! I have seen Erica and her projects around, and I have bookmarked EVERY project you highlighted today... How am I not a follower of B is for Boy? Duh! Headed over now! I've NEVER heard of Eric'as blog before but I'm whizzing over there right away. Thank you for sharing her with us. That bib idea is fantastic!